Being fifty-something, I love to see old things re-imagined to new and interesting uses. In fact, I’ve been loving this since I was thirty-something. And why shouldn’t your decor be a metaphor for your life? I expect my fifty-something years are going to be more and more about re-imagining and reinventing my life. Our house is filled with vintage items sourced thriftily and re-thought in novel ways. Not everyone’s a fan of second-hand decor, but for us it’s a way of life. We love the hunt, the gather and the creativity that goes into turning another man’s trash into our treasures. In our dining room alone, are several examples. They fill a big ugly gap – an above-eye-level aluminium window that was going to be very expensive to replace. 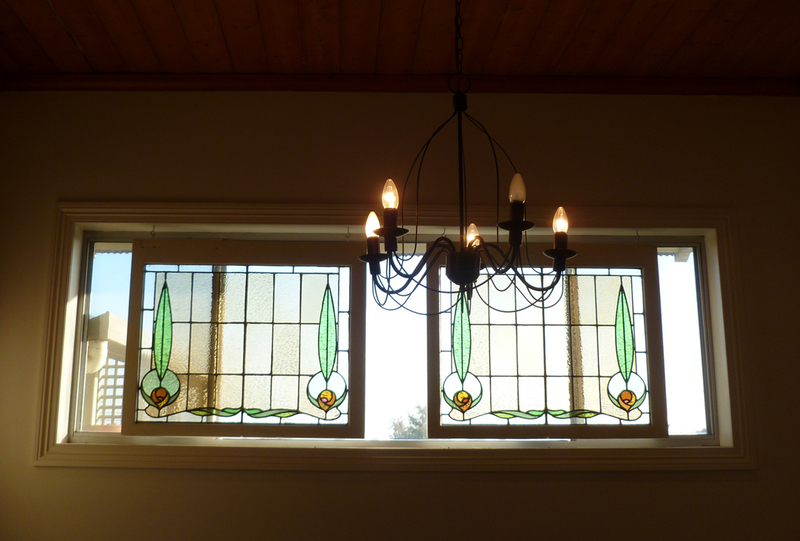 Instead, we sourced these two vintage leadlight panels at a garage sale (for about $30 each), repainted the frames to match the antique white trims of the room, added a period-style architrave to the window to match the rest of our 100-plus-year-old home, and hung the panels with cup hooks in the window space. The window faces north so the morning light streaming through the coloured glass is gorgeous and the glass detail takes the eye away from the fugly aluminium window behind. This always draws comments. It’s made from an old oak door, originally from a Melbourne bank but sourced by us at a demolition yard in Geelong. We wanted a large table and a normal door isn’t quite big enough (they look much smaller when you lay them flat). This one was oversize indeed. It also featured a deeper-than-usual recess. Mr P cut the door down a little, french polished it, housed in a lovely brass key-hole and handle, and attached it to a set of wooden legs donated by my brother-in-law (he had left the table outside and the top was weather damaged). 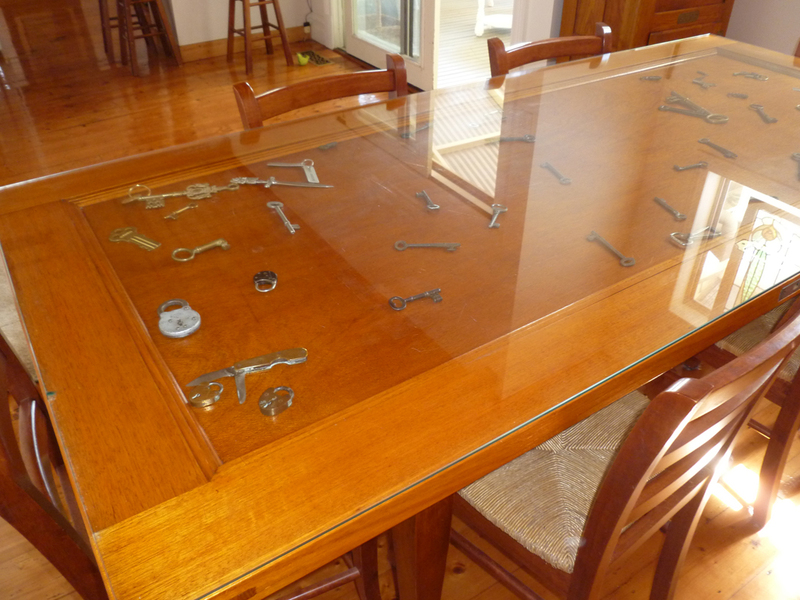 We had glass cut to fit and now display a haphazard collection of old keys, padlocks, bottle openers and utility knives beneath the glass, in the recess. I alway planned to change the display from time to time (how good would vintage cutlery look under there?) but we seem to just keep adding to the collection that’s always been there. People often bring us keys they find or source on their own hunting and gatherings. It’s a vintage balustrade we found looking sad and sorry at the local tip shop. 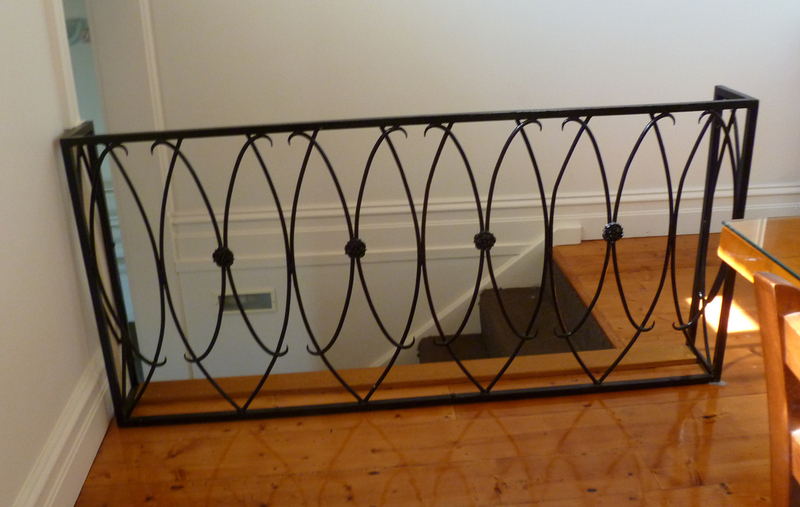 Painted up in glossy black, it’s a perfect replacement for the 1970s-style timber railing that it replaced. I love the fluid lines of the iron work. 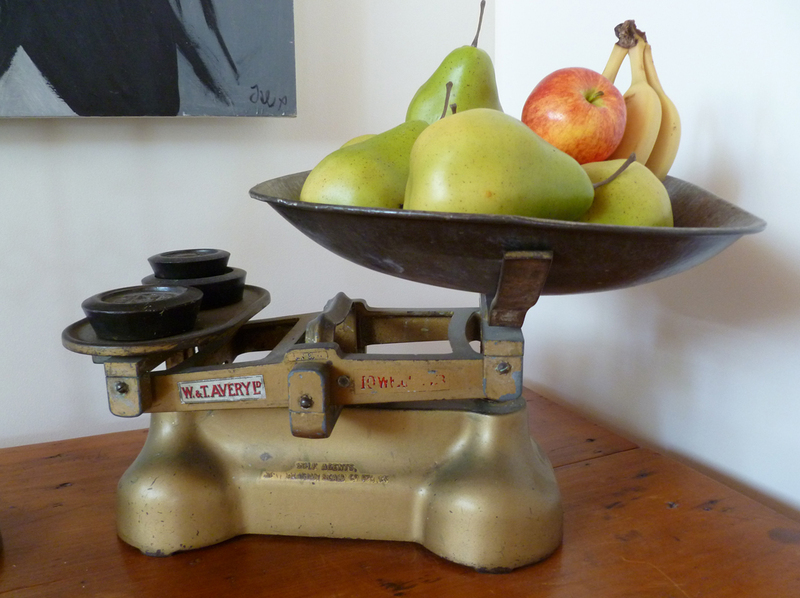 A vintage Avery scale and weights from a collectables shop, tidied up a little and re-purposed as a much-loved fruit bowl. All these objects are uniquely ours. They help us put an individual mark on our home by expressing who we are in our decor. What are you re-purposing or re-imagining? Please share … I love new ideas. How fun to come across your blog! I have been writing a blog since 2008, called Heart On My Sleeve: refashioning jewelry to refashion midlife. It seems I am not the only one to like the metaphor. What beautiful home projects! The vintage windows are especially beautiful.